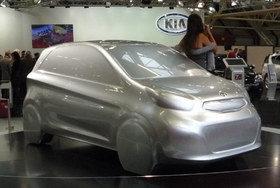 Kia unveiled a design study for the Picanto, its No. 2 seller in Europe, at the Bologna auto show. BOLOGNA, Italy – Kia has revealed design sketches and a full-sized styling mock up that hints at the look of its next-generation Picanto. The so-called “!” design study, which Kia unveiled last week at the Bologna auto show, reveals a more sculptured and dynamic version of the automaker's strong-selling minicar. 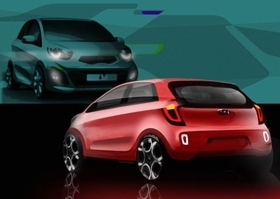 Kia also released design sketches of the next Picanto on Tuesday. The Picanto's fresh look aims to make the car stand out in the crowded minicar segment and "is designed to break the city car mould," Kia said. The 3200mm long, 1600mm wide glossy silver design study, which does not have windows or headlamps, was styled by Kia’s European design team based in Frankfurt, Germany, under the direction of Chief Design Officer, Peter Schreyer. Schreyer, 57, who is best known for penning the original Audi TT coupe, spent more than 20 years with Volkswagen and Audi before joining Kia in 2006. Kia said the production version of the Picanto will debut in March at the Geneva auto show and will go on sale shortly afterward. Kia released design sketches of the new Picanto, saying the car will exude "self confidence, solidity and maturity." With 40,934 sales through 10 months, down from 48,011 during the same period last year, the Picanto is Kia's No. 2 seller in Europe after the Cee'd compact model, according to market reseacher JATO Dynamics. Through 10 months, Kia's European sales are up 4.3 percent to 216,513 units while the total market is down 5.5 percent to 11.3 million units, according to industry association ACEA.